Peter Phillips and the Tallis Scholars returned to the Cadogan Hall for their second Choral at Cadogan appearance on Wednesday 20 April 2016 in an eclectic programme entitled O Death, come close mine eyes, which mixed contemporary music with the group's more familiar repertoire. Threading their way through the programme were four different Lamentations, Thomas Tallis's well known setting, the less well known version by Dominque Phinot. a brand new work by Matthew Martin, commissioned by the Tallis Scholars, and Nico Muhly's Recordare, domine (Lamentations) which the group commissioned in 2013. We also heard Martin's take on Orlando Gibbon's The Silver Swan and Orlando Gibbons' O Lord, in thy wrath. The programme opened with Arvo Pärt's Sieben Magnificat-Antiphonen followed by Vivanco's Magnificat (a 8) and concluded with William Cornysh's Magnificat. Though there were indeed some fine items in the programme, the different pieces did not quite coalesce into a satisfying whole. And it was only at the very end, after all the contemporary and unusual repertoire was out of the way, that the group seemed to really relax. The performance of William Cornysh's Magnificat (very much core repertory for this group) was electric and showed us what we had been missing. We opened with Arvo Pärt. Much of Pärt's choral music was written for continental choirs (the Sieben Magnificat-Antiphonen was premiered in 1988 by the RIAS Kammerchor), and often these groups are somewhat larger than their British counterparts. Sieben Magnificat-Antiphonen divides routinely into eight parts which meant that the Tallis Scholars had one or two singers per part. The result is to change the texture, we are no longer hearing a choral performance but intimate vocal chamber music, and reducing the number of singers places a great challenge on the individuals in the ensemble as the placement of Pärt's harmonies and irregular rhythms needs to be completely accurate. This we got in spades from the Tallis Scholars, as O Weisheit opened with a very light texture, the notes perfectly placed, small scale and highly intimate. Here and in other parts of the work I found that the bass part sounded a bit too light for my taste and though the sopranos were superb they dominated the texture a little too much. O Adonai (sung by just four men) was mysterious, with O Sproß aus Isais Wurzel developing more drama with a lovely strong edge to the dissonance. O Schlüssel Davids had a superb edge to to silences, but I did rather want more weight to the choral tone. But O Morgenstern was pure magic, making great use of the smaller ensemble. The multiple rhythms of O Konig aller Volker took a moment to settle but then the underlying beat was impressively metronomic. O Immanuel took us from soft-grained tone to a fine climax, with some fine straight tone though again I return to the soprano dominated texture. Like the programme as a whole, the performance of Sieben Magnificat-Antiphonen was something of a microcosm, with lots of lovely things never quite adding up to a greater whole. The Magnificat by Sebastian de Vivanco (c1551-1622) took us to Renaissance Spain and a very different sound world. Vivanco alternated plainchant with polyphonic verses as was common at the time, with the polyphony being nicely lively with a highly mobile texture and finely pointed rhythms. Et misericordia was rather more contained, and beautifully expressive, with the final verses returning to the more rhythmically intense style. Nico Muhly's Recordare, domine (Lamentations) was written for the Tallis Scholars in 2013. A setting of the first five verses of Lamentations, chapter 5, Mulhy starts with fragments of melody over a drone in a sound-world not that distant from that of Arvo Pärt. But this develops into some rather effective polyphony with a strong harmonic edge to it. There was a lovely clarity to the writing for all Mulhy's use of dissonance. The ending, with the repeated soprano Jerusalem and other parts weaving around them, was highly effective. Thomas Tallis's Miserere nostri, with its complex structure of multiple canons, was sung with a lovely fine-grained tone and a sense of the individual voices weaving in and out of the texture. The first half finished with the first of Thomas Tallis's Lamentations, in a performance full of elegant melancholy. The singers really pointed the music according to the words, and instead of a single unified texture we got a sense of the individual voices. The concluding Jerusalem was beautifully poised and controlled. After the interval we heard the premiere of Matthew Martin's Lamentations of Jeremiah which sets verses eight to 11 of chapter two. Martin's opening had a strong sense of bi-tonality and this was a texture which Martin returned to repeatedly during the piece. He developed a real sense of hard edged drama arising out of rather poised polyphony, with some really vibrant moments. Though the work was written for the Tallis Scholars there were moments when the music seemed to need a greater weight of singers. But the whole was really attuned to the words, developing a sense of dramatic narrative. The programme notes did not explain what we were listening to in the next item. Billed as Orlando Gibbons (1583-1625)/Matthew Martin The Silver Swan it was not quite clear which composer was responsible for what. I think we opened with Martin's own setting of the words, sung by one group of singers, followed by the Gibbons, sung by the other group. But Martin's setting with its evocative solo soprano, seemed to take elements of Gibbons and metamorphose them. The result was intriguing and evocative. Gibbons O Lord, in thy Wrath is more like a sacred madrigal than an anthem. The performance was beautifully shaped but I would have liked a more intense sense of the anger and anxiety present in the words. Dominique Phinot (1510-1556) is not a well known composer but he is an important pioneer of poly-choral music. His Lamentations uses two choirs and in the opening section he seemed determined to demonstrate this, having the two choirs answering each other in lots of very short phrases. A very civilised music, but very appealing. Having demonstrated one poly-choral style, Phinot then used all the upper voices and then all the lower voices, before finally using his singers in a full eight-part texture as if he wanted to show everything that could be done. In the final Jerusalem, with its multiple repeated phrases and lots of imitation, Phinot created a very pleasing whole. For the final item, it was as if someone had switched an extra electricity supply on. From the opening notes of William Cornysh's Magnificat the singers moved up a gear and there was a feeling of the performance being really energised. It is a typical piece of early Tudor polyphony with lots of sections for smaller groupings of voices and extended use of melisma in long fluid lines. 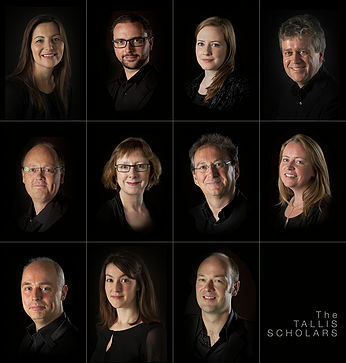 The Tallis Scholars really brought it to live and there was a wonderful vibrancy and immediacy to the performance which meant we ended on a real high.